Levi’s is a company that has always had a strong Brand Purpose, a shared goal of improving people’s lives and positively impacting society. The Levi’s Brand has always believed that a business can deliver profits through principles and strong core values. Levi’s patented the original blue jean in 1873. Doing the right thing has alway been part of the brand’s heritage. The 1906 San Francisco Earthquake and Fire destroyed Levi’s headquarters and two factories. The company responded by extending credit to its wholesale customers so they could get back on their feet and back in business. Employees’ salaries were continued, and a temporary headquarters and a showroom were quickly opened in order to keep employees working. I had the pleasure of working in marketing on the Levi’s Brand for nine years. The mission at the time was to sustain profitable and responsible commercial success by marketing jeans and selected casual apparel under the Levi’s Brand. We will conduct our business ethically and demonstrate leadership in satisfying our responsibilities to communities and to society. We believed that business can drive profits through principles, and that values as a company and as individuals gave us a competitive advantage. Many companies talk about values but few become part of the culture and inform everyday decisions. The apparel industry has faced challenges because it is a contributor to global environmental and social issues. In the 1990’s, Levi’s developed the first set of comprehensive standards for manufacturing worldwide dealing with wages, hours,working conditions, ethics and government. 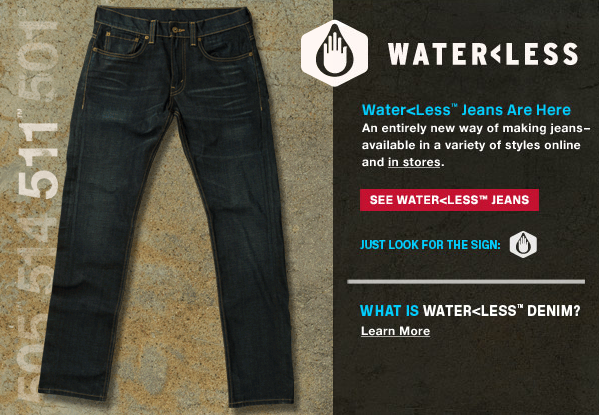 Recently Levi’s launched a more sustainable line of denim that uses significantly less water during the finishing process, called the Water<Less Collection. Levi’s continues to prove that you can balance making money with doing the right thing. Former CEO Walter Haas summed up Levi’s Brand Purpose very well “Each of us has a capacity to make business not only a source of economic wealth, but also a force for social and economic justice.” Its a shame more brands don’t think this way. What brand’s do a great balancing profit with doing the right things?